Who doesn’t love a good, juicy, cheese-topped (or cheese-filled, as you’ll soon learn) hamburger? I know I sure do. Sometimes it’s best to stick to the classics… and sticking to the classics is something people seem to love. According to PBS, “On average, Americans eat three hamburgers a week.” Me? Not three, but, I’m a simple guy. A burger with cheese, lettuce, tomato, ketchup and some mustard… I’m all set! A fun fact you can surprise your guests with is that hamburgers get their name from Hamburg, Germany and that the “hamburg steak,” as it was originally known, is now called the hamburger. 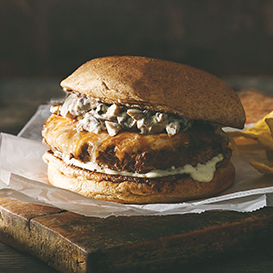 Whether you prefer a simple burger or want a burger with more flair, we have good news for you. Get your friends and family and gather in the kitchen for the ultimate cooking experience. Our Aprons chefs, the geniuses in the kitchen behind some of your favorite recipes, have come up with some of the tastiest and trendiest hamburger recipes I’ve ever tried. Trust me, one amazing skill that our Aprons team has is the ability to adapt to your family’s ever-evolving taste buds. 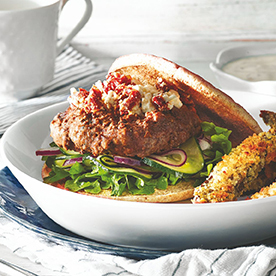 These burger recipes are the perfect solution for a dinner that your whole family is guaranteed to love. Cheese in a burger? Yup, you read that right. Cheese…stuffed in a burger. Include toppings such as lettuce, sautéed onions, tomatoes, and pickles. Preheat grill. Combine ground chuck, onion and Worcestershire sauce until combined. Divide into eight portions and form into thin patties. Place cheese slices on four of the patties; top with remaining patties and pinch edges to form a tight seal (wash hands). Season patties with salt and pepper. 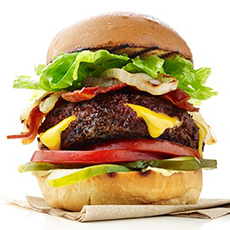 Place burgers on grill; cook 3–4 minutes on each side or until desired doneness. Remove burgers from grill and let stand five minutes to rest. Toast buns. Heat bacon following package instructions. 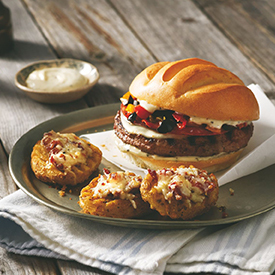 Assemble burgers, including desired condiments and toppings. Serve. Mushrooms and shredded Mexican cheese makes for a delicious flavor combination you’re going to love. Preheat grill (or grill pan) on medium-high. Add mushrooms to bowl; coat with cooking spray. Place beef and 1/2 cup cheese in second bowl; mix until blended. Form beef into four patties. Wash hands. Grill mushrooms 3–4 minutes, turning once, or until charred with grill marks; transfer to cutting board. Place burgers on grill; grill 3–4 minutes without turning. Flip burgers over; top each with remaining one cup cheese. Grill 4–5 more minutes or until cheese melts and meat is 160°F. Chop mushrooms coarsely; toss with two tablespoons dressing. Coat bottom 1/2 of each bun with one tablespoon of remaining dressing; place burgers on bun. Top each burger with 1/4 cup mushroom mixture and top half of bun. Serve. Take your taste buds on a trip with this hand held version of the Mediterranean. Slice one half each cucumber and onion thinly (about one cup each). Chop tomatoes (about three tablespoons). In small bowl combine rice vinegar, agave nectar and 1/4 teaspoon salt; stir in cucumber and onions and set aside. Combine meat, herb seasoning, pepper and remaining 1/4 teaspoon salt; form into four patties. Wash hands. Place meat in grill pan (or on grill); grill 2–3 minutes on each side and until 160°F. Combine feta and tomatoes until blended; divide over top of patties, then remove from heat. Toast buns lightly. Assemble burgers in this order: bun, arugula leaves, cucumber mixture, burger, more cucumbers (optional) and top of bun. Serve. Hard salami on top of a ground beef hamburger. Uniquely delicious. Top each patty with one slice cheese and two slices salami; let stand to melt cheese. Chop peppers and combine with olives. Spread two teaspoons peppercorn dressing on inside of buns. Place patties on bottom halves of buns; top each with two tablespoons olive mixture. Assemble burgers and serve. Barbecue sauce on a hamburger? Give it a try, you won’t go back! Preheat grill on medium-high. Combine mushrooms, green onions and roasted garlic in microwave-safe bowl. Microwave on HIGH 1-2 minutes or until mushrooms are tender; set aside. 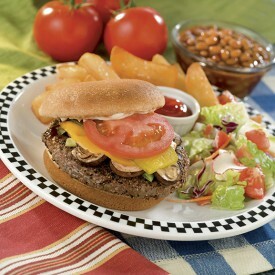 Cut tomato into thin slices to top burgers (add any extra tomato to salad); set aside. Place patties on bottom halves of rolls; top with pickles and tomato slices. Spread barbecue sauce and mayonnaise over top halves of rolls. Assemble and serve. There it is my hamburger-loving friends! My favorite burgers from our Aprons teams. Try them on your next family night and be sure to let us know in the comments below what your favorite ingredient to add is!